What can be more sixties than Jean Shrimpton in a pink space helmet on the cover of Harpers Bazaar? The Sixties were about to explode and in this time capsule the worlds of fashion and space collided. No wonder that Harpers Bazaar asked famous photographer Richard Avedon to create the look that became emblematic for the sixties when Mod was king, Pop Art queen and space age the dominant popular culture. The whole 20th anniversary edition of Harper’s Bazaar’s was devoted to capture this moment in time, one way or the other. Richard Avedon, who became the first guest editor in Harpers Bazaar’s history, edited and photographed the 1965, April magazine entirely. Still one of the most memorable fashion magazine issues of the 1960s, this special April cover, featuring Jean Shrimpton in the pink Day-Glo space helmet, made the American Society of Magazine Editor’s 2005 list of Top 40 Magazine Covers. This cover of Harper’s Bazaar is a photograph of model Jean Shrimpton by photographer Richard Avedon. The cover of Shrimpton peering from behind a bright pink Day-Glo space helmet was designed by Art Directors Ruth Ansel and Bea Feitler. This photograph, with the Harper’s Bazaar logo vibrating against it in acid green has been often reproduced as an emblem of the sixties. 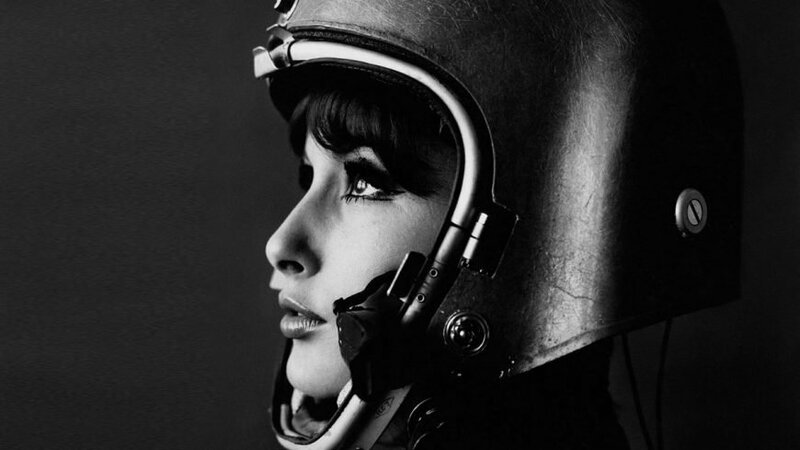 Meanwhile the iconic photographs of Jean Shrimpton in a space suit and Donyale Luna ran along pages with portraits of a young Paul McCartney (also in a space suit, borrowed from NASA), Ringo Starr and Bob Dylan. Avedon photographs embraced as well the people he admired from the art world , like Henry Geldzahler, Jasper Johns, Roy Lichtenstein, Robert Raushenberg and Alex Hay. In addition to that there’s artwork from experimental film maker Stan Vanderbeek. I wrote about his daughter Sara VanDerBeek’s exhibition in Rome in Retroblog Rome’s blogpost ” Sara VanDerbeek’s fascination for the eternal city Rome “. The April 1965 issue included also George Segal’s,”Woman Washing Her Feet”. Jean Shrimpton as a galactic space girl represented the face of youth culture, albeit one with a twist. In the actual world the idea of a female astronaut was something unheard of. But still, in the 1960s Jean Shrimpton was a real fashion icon, known as The Shrimp. She was an It girl elevated to the supermodel celebrity status due to photographers like Richard Avedon and David Bailey, with whom she had an affair. David Bailey was credited for turning her into one of the world’s most successful models, but she broke his heart when she left him for actor Terence Stamp. Nothing changed since the sixties in that sense, one could say. After 20 years with Harpers Bazaar Richard Avedon left the magazine in 1966 and joined Vogue to follow in the footsteps of Diane Vreeland, who had become its editor-in-chief.